Aside from the emotional preparation, it is also important to know what to expect when the time for surgery comes around. Courtney Bowles is a certified Child Life Specialist at McLane Children’s Scott & White and helps children deal with medical treatment in a positive way. Bowles and her staff work to normalize the surgery experience and explain it to children in terms they understand, and have developed a “Bud E. Bear” Program to help children know what to expect. “The more a child is prepared for surgery, the better they cope,” she explains. Research has shown that younger children typically benefit from preparation one day before or the day of surgery, whereas older children can benefit from preparation up to five days in advance. “I believe that when preparing a child for surgery, psychosocial and medical preparations are needed,” says Bowles. On the psychosocial level, make sure you talk about the surgery on a level they can understand. This means to use words that they understand, and explain that the doctor is going to help fix whatever the matter is. It will depend on the type of surgery as to what medical preparations are needed, but typically all children have a pre-op appointment to guide you in the medications to take or if your child needs to be fasting prior to surgery. Your doctor or nurses are happy to answer questions or give tips to help your child before the big day. All surgery patients work with a team at our McLane Children’s Hospital Scott & White that tailors everything to children. “Having a hospital specifically designed for children has been wonderful,” says Bowles. Pre-Op: The day of surgery, you will arrive and a nurse will conduct a pre-op, or preoperative exam. Here, we will get your child’s height, weight, vital signs and medical history. Anesthesiologist & Surgeon: After the pre-op is complete, then the anesthesiologist will visit with you. Your anesthesiologist is trained to administer gas or injections to help control the pain during operations and procedures. Your surgeon will also meet with you and they will both will explain the process and answer questions. Child Life Explanation: From there, you will get to see a child life specialist like Bowles, who works with you from a psychosocial perspective. They will show your child a book with pictures of everything throughout the surgery process: the rooms, machines and more. This helps the child feel comfortable and aware of what is to come. Going into Surgery: “Here at the children’s hospital we also have different options for how children can go to surgery in order to make it more enjoyable for them,” says Bowles. The child can choose from riding in a wagon, a scooter car or the bed. Hugs and Kisses Line: This is the point where the child and the family will part ways. It is a place where “hugs and kisses” are encouraged and say “see you later,” not “goodbye.” This reassures the child that they will see their family when they wake up from surgery. This important part of the day is talked about clearly, so the transition is not as difficult for your child. Surgery Procedure: Surgeons will complete the procedure using the highest quality equipment and to the best of their ability. The environment will be clean and safe, the needs of your child in mind. You will be guided to an area for families and given an estimated waiting time. 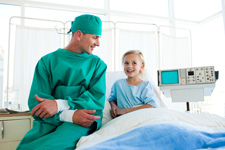 Recovery Room: After the procedure you will be reunited with your child to recover together. This is a time to ask how things went and connect with your child on an emotional level. To help you prepare your child for surgery, McLane Children’s Scott & White has also developed a Bud E. Bear program. This program will help your child feel safe, comfortable and ready for surgery. Has your child had surgery? What preparation did you find helpful? Next post: Is Your Teenager Coping with Grief?